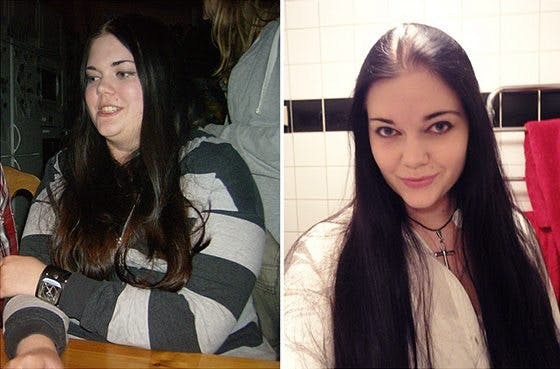 This is Emelie before and after LCHF, 18 months and losing 55 pounds. Such a beautiful girl - an inspiring success story! Wow! Thanks for sharing this, it's such a great example of how avoiding sugar can save your health and take off the weight with all it's puffiness. She looks great and must be ecstatic that she's taken her health into her own hands. What did she do for exercise? It feels almost unfair to me when some people just do something simple like avoiding sugar and loosing all weight they need. I gave up sugar, grains, starches, fruits, and it took me almost 4 years to loose over 30 lb. Don't tell me about exercise, I have been active all my life doing various activity in intervals, long endurance, you name it , I did it. It is easy for some, hard for others. She is young, she needs it in order to have a normal life, not crippled by excessive weight. You go, girl! I find that since I’ve changed my lifestyle my taste has changed. I no longer like sweet tasting food or drinks. Since putting the wheat and sugars out of my diet, I’ve lost 145 pounds in the past 21 months. I don’t even care for foods sweetened with so called healthy sweeteners. Has anyone else experienced this? I don’t believe any sweeteners are good for you. It’s like an alcoholic drinking near-beer or a heroin addict on methadone. What a feeling of freedom I enjoy not being hooked on sweet stuff. @GalinaL: "It feels almost unfair to me when some people just do something simple like avoiding sugar and loosing all weight they need." The thing is, some people have no discipline whatsoever when it comes to sugar and sweets. They eat enormous amounts of cakes and cookies and rolls and drink soda by the quart. If they are able to stop eating and drinking those food items, they only need to replace it with a very small amount of food because those foods provide lots of calories and almost no nutrition. So their daily intake can decrease dramatically and yet they will not feel hungry and will probably feel much healthier and in a better mood. I agree that it can be unfair, but I am not sure that it is simple.